More than a third of Brussels’ inhabitants are foreigners with voting rights in their local elections. But despite many of them working within the EU institutions at the heart of the Continent’s democracy, Belgium has close to the lowest voter participation rate among EU citizens in Europe. Why? Which barriers do EU mobile citizens face to exercise their political rights? Which initiatives have been developed to tackle the issue? This is what the webinar taking place on January 29th will exactly dig into. With their stories and experiences, Anna Zaremba, EU Rights Coordinator at the European Citizen Action Service (ECAS), and Thomas Huddlestone, leader of VoteBrussels campaign and research director at the Migration Policy Group, will lead the participants to explore the trends, barriers and initiatives of EU citizens that live in an EU country different from their original one (click here to register). 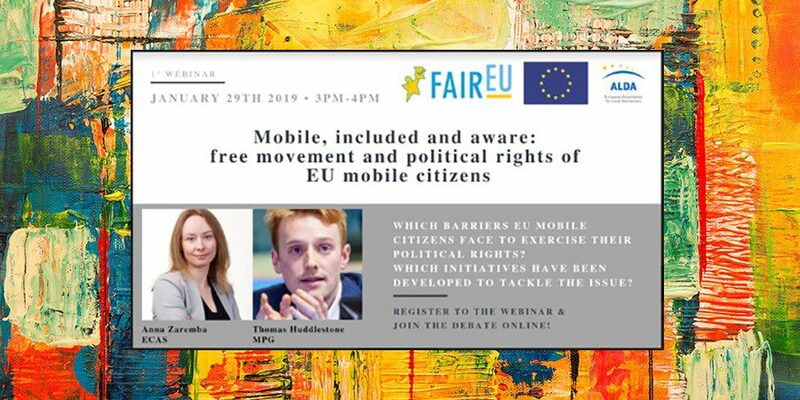 About: The webinar is part of a series of webinars that the European Association for Local Democracies (ALDA) has developed in the framework of the FairEU project, aiming at fostering the successful inclusion of EU mobile citizens in their host EU country’s civic and political life. The 6 webinars will take place once per month starting from January until June, with a duration of about 1 hour each. Drawing on FairEU project’s results and on the experience of invited specialist speakers, the webinars will be devoted every time to a different aspect: stakes and tools to increase the turnout of EU elections, facts and learning from last Brussels’ elections, the Road Trip Project to foster youth’s support to EU, reports on political participation of EU mobile citizens in the European countries. Target: The series targets all those professionals (Civil Society Organisations (CSOs), public authorities, companies) and citizens interested in citizen engagement, political participation and expat-related services, such as offices/ platforms/ blogs/ services supporting the arrival and integration of newcomers. A participatory-oriented approach, within the limits of online webinar technology, characterizes the webinars. Participants will have the possibility to make live questions and observations, provide feedback that will be integrated in the following webinars and propose the topics for the last webinar. Info: We are glad to inform you that the registration to the webinar is free of charge. It can be done by registering here. You can receive updates about the outcome of every webinar and the introduction of the following ones by subscribing to this monthly, 5-minute-reading-time newsletter (subscription form).